Back when I made the announcement that I was going to switch up this blog to make it more travel photography-based and have more a focus on videos, training, and techniques, I kind of forgot all the material I had built up before in both Hong Kong and mainland China. And while I’m extremely excited to start showing off the new format of video, photography, tutorials, and the like, I’ve still got some cool content to show off, starting with some pictures of Hong Kong Disneyland. Now, since I’m switching up the format a bit, I’m going to describe the photos and how I shot them. Basically, I’m going to run through with a bit of a guide to each image. 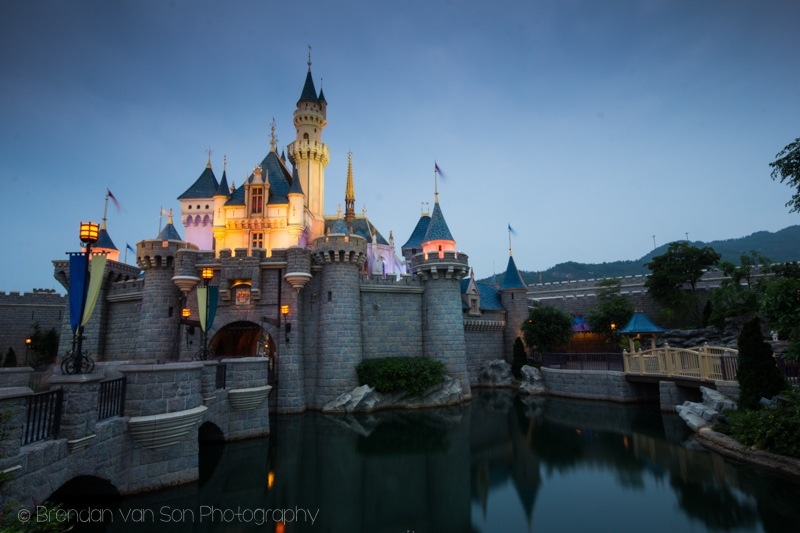 But, before we get into the photos, let me tell you a little bit about Hong Kong Disneyland. First of all, it’s completely different to what I remember Disneyland in America to be like. It’s smaller, yes. But it’s also the vibe that’s different. I guess part of that has to do with the fact that it’s been a couple decades since I visited Disneyland in California. The Hong Kong Disneyland is cool, though. It’s really great entertainment for a day. The ride are obviously more geared to a younger crowd, but we still found some stuff well worthy of our attention. In fact, I think we rode the mine car ride about 6 times in a row. It was that good. From a photographer’s perspective, Disneyland was way better than I had thought it would be. I left my 70-200mm lens at home and regretted it within minutes of arriving. 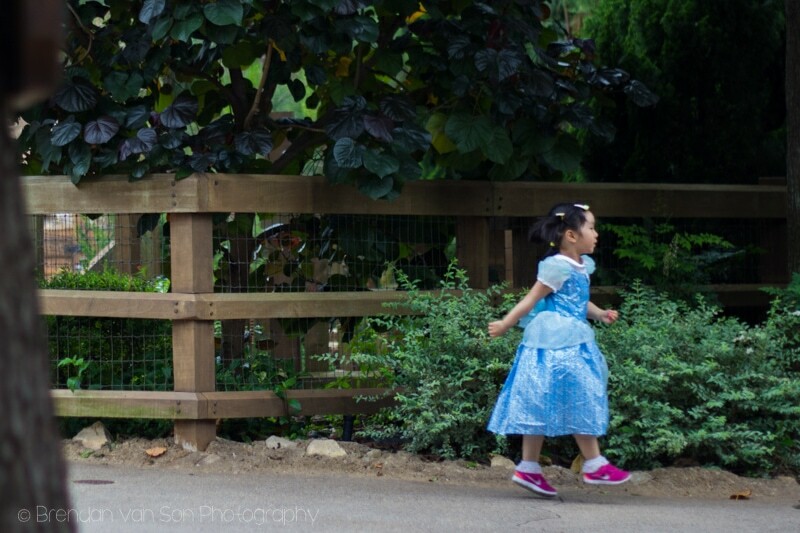 I’m not sure if this is done in North America, but in Hong Kong a large percentage of the kids dress up as their favourite Disney characters. It would have made for some fun photos had a brought the telephoto zoom lens. Anyways, I did what I could with what I brought. Here are the images. 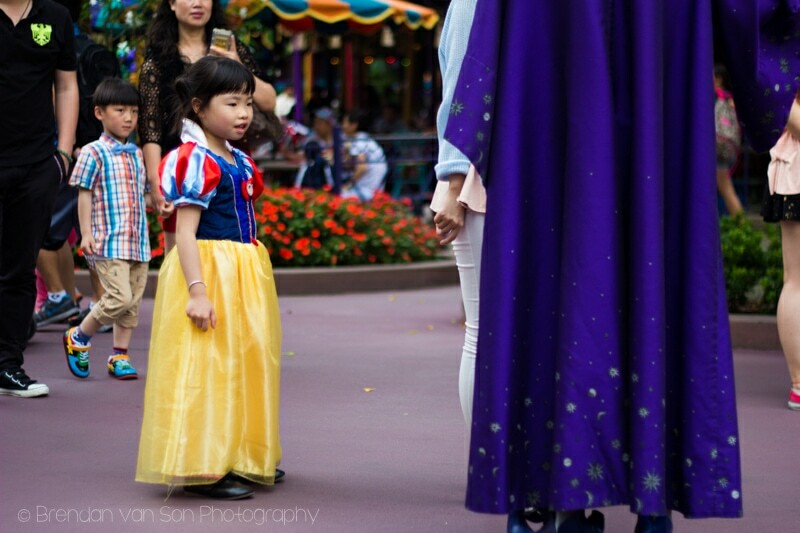 I made a huge mistake not bringing my 70-200mm to Hong Kong Disneyland and had to make do shooting portraits and images like this on my 50mm f/1.8. I saw this girl skipping down the street and tried to get an image of her mid-skip. I took the image at f/1.8 to speed up the shutter. 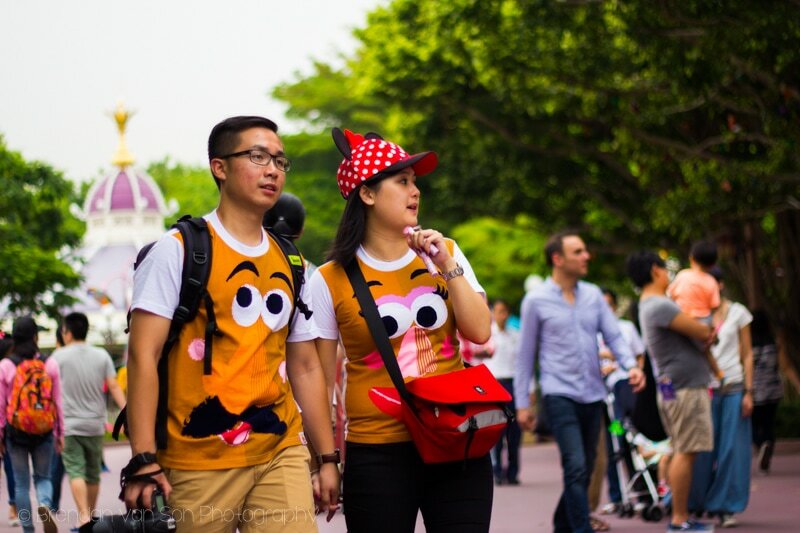 In Hong Kong in general, there are so many couple that wear these matching T-Shirts. You wont catch me alive wearing a matching shirt with my significant other, but some might call it cute. Again, I shot this on my 50mm at f/1.8 because I really wanted the background blurred as much as possible. Also, with a really harsh mid-day light, I used the spot meter on my 60D to ensure I got the right exposure. It’s funny how everyone dresses up for Disneyland. I wanted to capture a bit of that, but get it in a cool scene. This girl was waving to her dad every time she passed on the merry-go-round. To get this shot, I did some panning. I used my Sigma 10-20mm and shot it at f/6.3 which brought the shutter down to 1/15seconds, enough to create a blur but still keep the subject in focus. 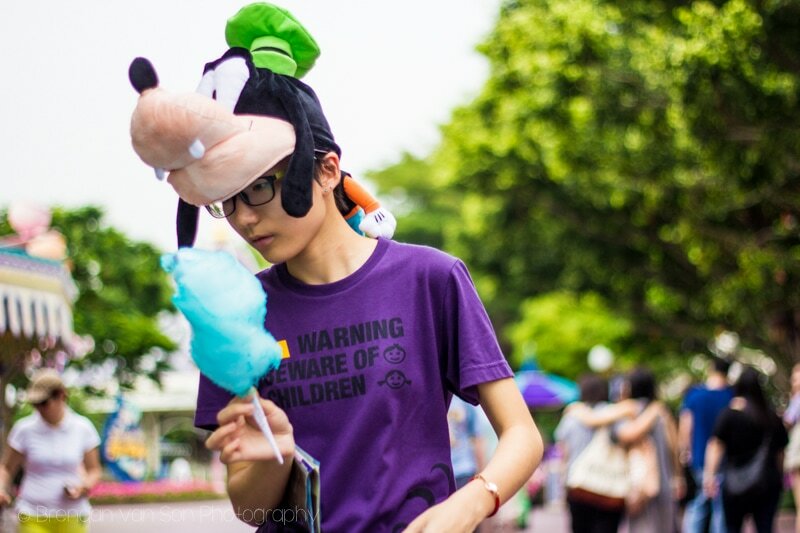 If this guy’s hat wasn’t cool enough, and his shirt wasn’t awesome enough, the look on his face well staring at his cotton candy was perfect. Like most of my 50mm shots, I took this at f/1.8 to really blur the background. I focused on the subject’s eyes which tell the story of an image like this. 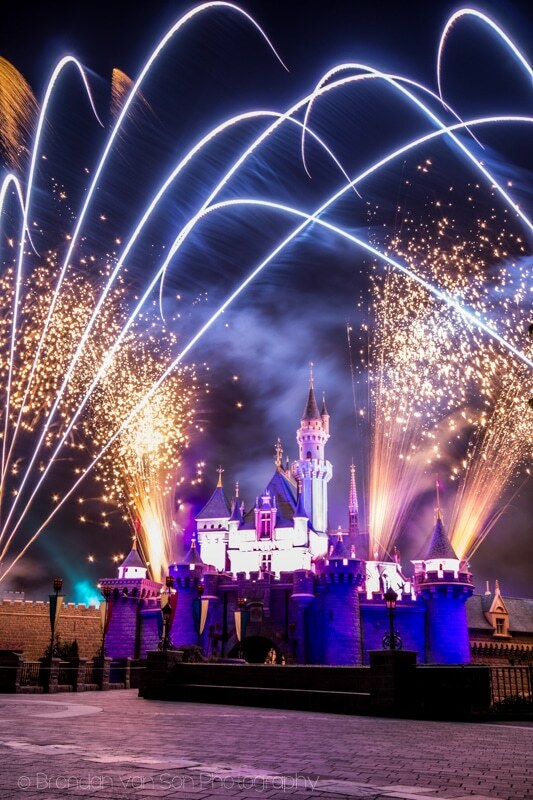 The castle at Hong Kong Disneyland is quite small in comparison to the others, but it’s still a cool shot. 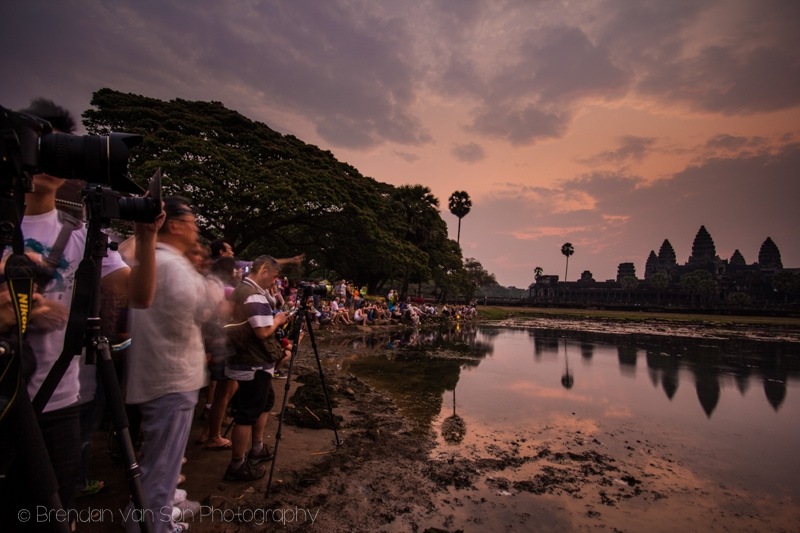 I took this image at the start of the blue hour with the 10-20mm lens. To get the right exposure, I shot 8 seconds at f/16. ISO 100. 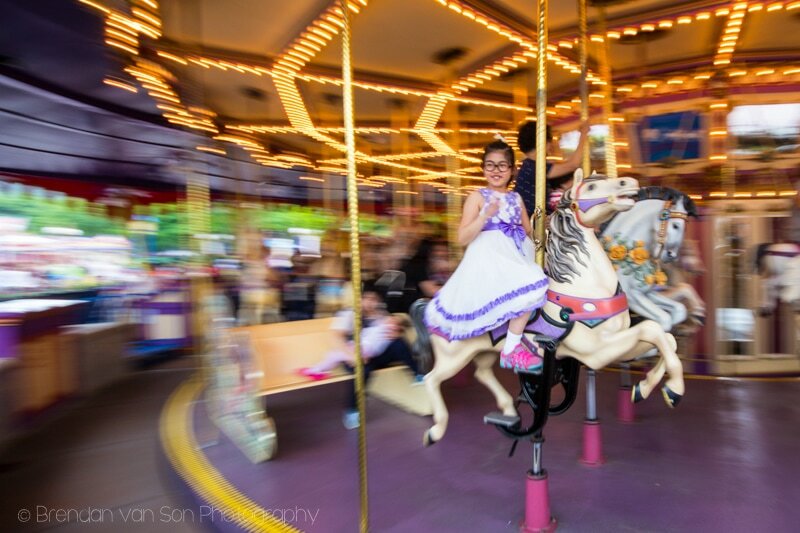 This is another one of the panning photos, like the one from the merry-go-round. I shot this one on my 50mm, though. 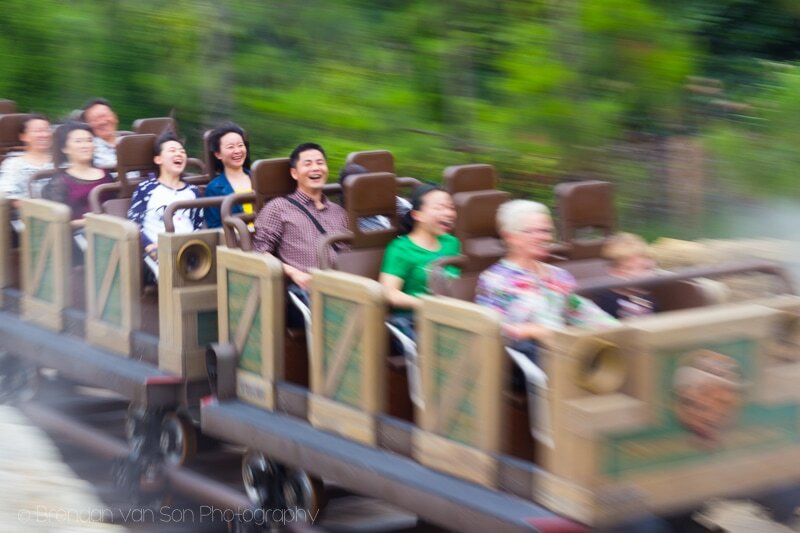 With the rollercoaster moving so quickly, I only had to shoot 1/40 to get the motion blur. I shot an aperture of f/10. I’ll be honest, I struggle with photographing fireworks. It is a bit of a crap-shoot sometimes because you don’t know where the fireworks are coming from, nor do you know exactly how bright they’ll pop. Also, you really only have the first couple of shots to take before the smoke in the air starts ruining photos. I set my exposure at 13 seconds, f/11, and used a focal length of 15mm for this image. 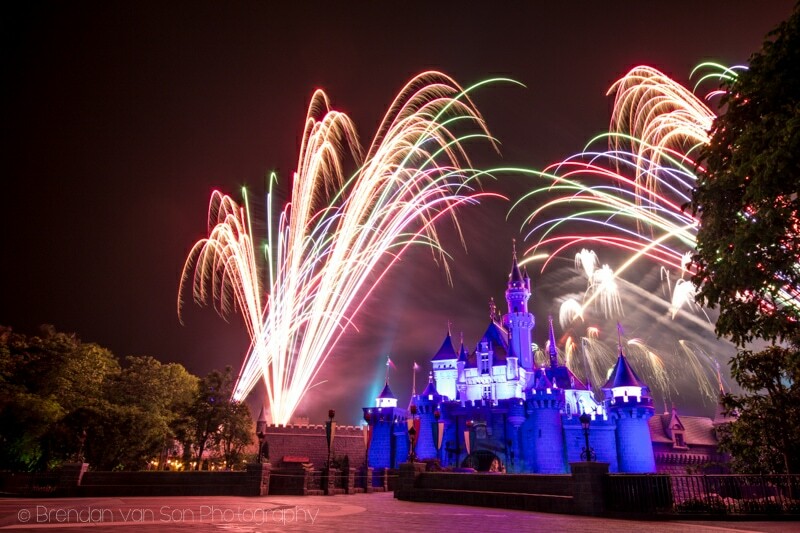 Likely the only image I really liked from the fireworks show at Hong Kong Disneyland. I exposed this image a little bit longer than the other one with the same shutter time of 13 seconds, but an f-stop of just 9. It’s amazing how the image above looks brighter despite being exposed less. That is the challenge of photographing fireworks. 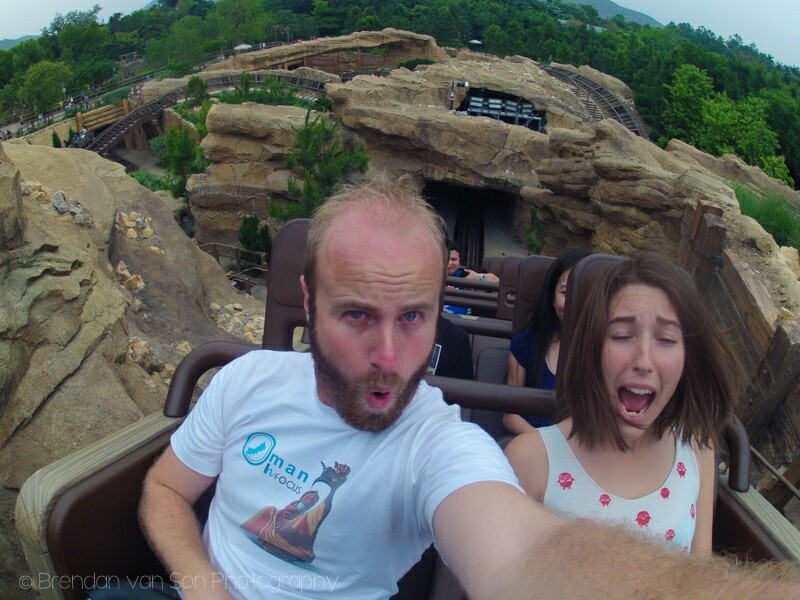 And just for the fun of it, a roller coaster selfie. I really need to learn more about which apertures to use for the different shots. I’m so amateur compared to the amazing photos you take. Thanks for explaining how you took each photo, it definitely helps. Thanks Sandra! If you do the YouTube thing, I’ve just started producing travel photography tip/tutorial/how-to videos http://www.youtube.com/bvans890 it might be worth subscribing if you’re looking to improve!